Dr. Norma Bailey, keynote presenter. On Friday, October 10, members of Auburn University’s College of Education community gathered in the student center for the 2014 Social Justice and Equity Lecture Series. 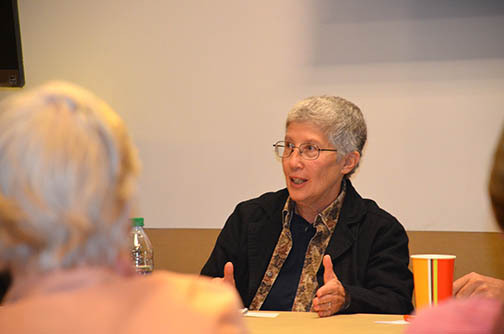 The event, co-sponsored by the College of Education Diversity Committee and the Dean’s Office, was entitled Beyond Tolerance: Conversation on LGBT Advocacy. The event featured a presentation and a workshop by Dr. Norma Bailey, who is professor emeritus in middle grades education at Central Michigan University. Bailey’s teaching and scholarship has been largely focused on addressing the needs of gay and lesbian youth in public schools. Dr. Bailey encouraged attendees—a group largely comprised of College of Education students and faculty, along with students from other nearby Alabama colleges and universities—to “break the silence” and make schools safe for all children. She noted that gay and lesbian youth are “no more special and no less special than anyone else” and that they deserve equal representation in the curriculum and equal protection from harassment and hate speech. The event also featured a panel focused on the issues faced by LBGT youth in schools and in the community. Panelists were Emily Kerzin (doctoral student in counseling psychology), Ariel Barasch (president of Spectrum: Auburn University’s Gay-Straight Alliance), Dr. Paul Hard (faculty member at AUM and plaintiff in marriage recognition lawsuit against the State of Alabama), Dr. Norma Bailey, and Dr. Stacey Nickson (Director of K-12 Outreach). Dr. Nickson facilitated the final activity of the day, a Culture Bump workshop designed to give participants tools for using human differences as a means to connect with others meaningfully and productively.